"Fire Season both evokes and honors the great hermit celebrants of nature, from Dillard to Kerouac to Thoreau--and I loved it." " Connors's] adventures in radical solitude make for profoundly absorbing, restorative reading." Phillip Connors is a major new voice in American nonfiction, and his remarkable debut, Fire Season, is destined to become a modern classic. 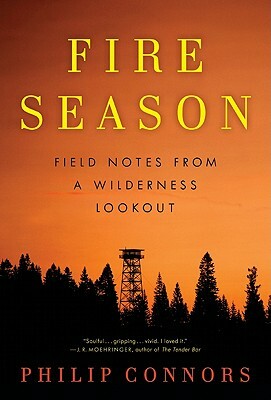 An absorbing chronicle of the days and nights of one of the last fire lookouts in the American West, Fire Season is a marvel of a book, as rugged and soulful as Matthew Crawford's bestselling Shop Class as Soulcraft, and it immediately places Connors in the august company of Edward Abbey, Annie Dillard, Aldo Leopold, Barry Lopez, and others in the respected fraternity of hard-boiled nature writers. “Philip Connors has crafted a book illumined by the gob-smacked, wide-eyed, inquisitional wonder at creation. . . . Fire Season is for pilgrims, pedestrians, hikers and anchorites, city dwellers, and solitary sorts: a treat for the senses, fit for the long haul. Bravo!